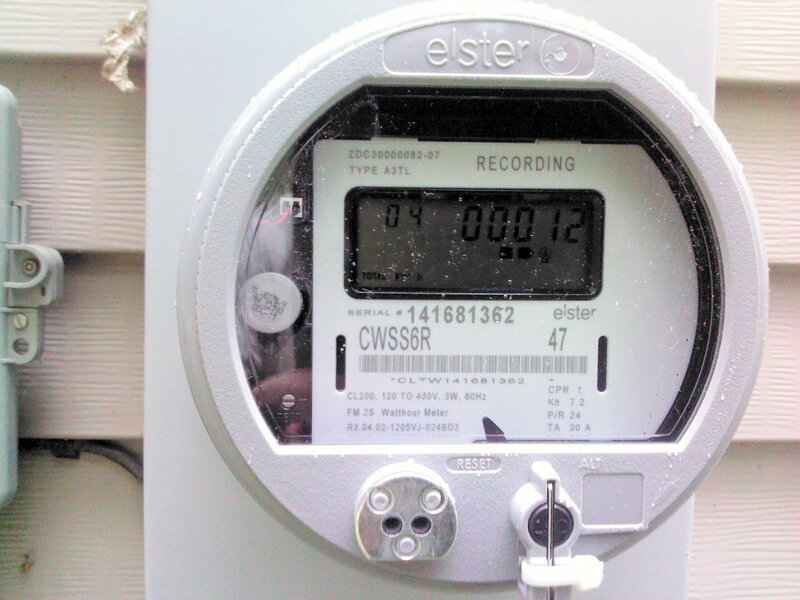 This blog is about my experience with Illinois ComEd's (Commonwealth Edison) Residential Real Time Pricing (RRTP) electrical rate program installation process. According to ComEd's FAQ page, "The majority of RRTP participants who participated in ComEd RRTP for all 12 months in 2010 experienced electricity savings ranging from 5% to 16% on their annual electricity bill, as compared with what they would have paid with ComEd's fixed-price rate." My friend Steve had also had an electric energy audit done and the auditor highly recommended the program. I went to the ComEd website and signed up for the real time pricing program and the air conditioner cycling program on August 26th 2012. There is no charge to participate in either program. The premise is by charging you based on real time fluctuating electric rates and allowing the utility some control over your air conditioner usage - you can help them to lower the cost of delivering electricity. By doing that they'll share the savings with you on your electric bill. 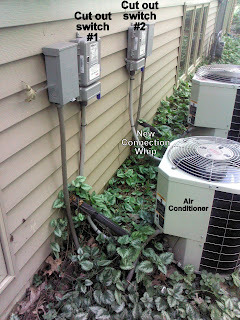 I choose to go with the 100% option on air conditioner cycling since our house has extremely good tree coverage. Even on the hottest days our house is well protected from the midday sun. 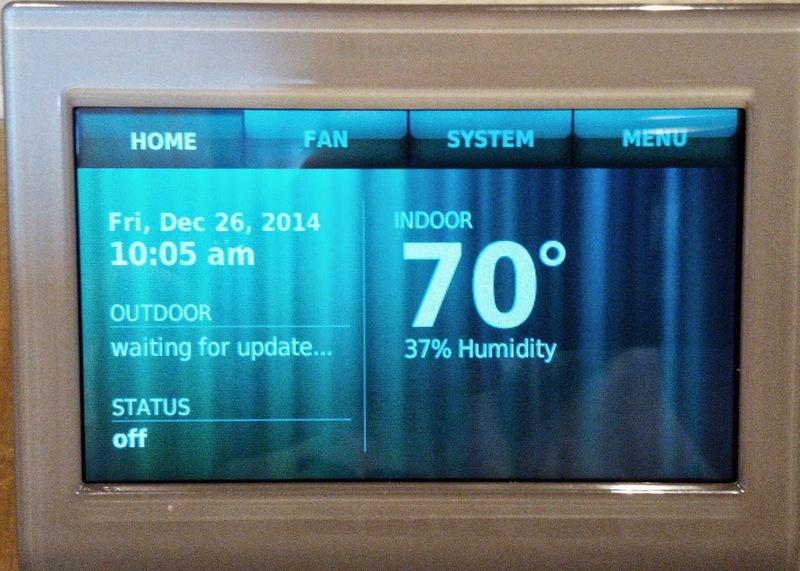 The 100% option allows ComEd to "Up to one continuous 3-hour period during any weekday (if needed)". The flashy new meter was installed September 7th (12 days after signup). The meter replacement person needed to come back a second time (left a note on the front door), since my meter was a different style than she had on the truck the first time. 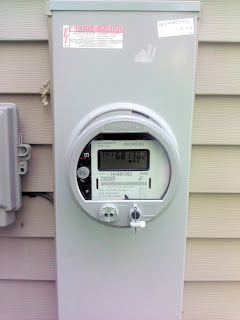 The meters are digital and replaced the old mechanical wheel style meter we had. The was no charge for the power meter replacement, but I believe we have to stay in the program for 12 months or they may charge us back for it -or the replacement meter. In my case the air conditioner cutoff switches (one with big ComEd sticker on it) were installed on September 14th (19 days after signup). We have two air conditioners for our house so they installed two "wireless" cutoff switches. The switches appear to cutoff the power after our manual switch and before it gets to the actual air conditioner. The only visible thing that the home owner can see is a green led light through the switch window. On September 17th (22 days after signup) we got an email that gave us login information for the website (https://il.thewattspot.com) with a temporary password and login. This website allows you to make changes to manage program participation, change high watt/hour email alert limits, view predicted and actual hourly prices, and view program savings. As of October 5th I still couldn't see my electric usage online, but my understanding is it takes billing cycle for everything to be fully in place. The bill that we got on Septemper 20th (25 days after signup) did include a $10 A/C Interruption Option Credit. but didn't appear to be full switched over to the real time pricing. I hope this blog post help you understand what the installation process for the RRTP program looks like, and gives you a better understanding when you can start enjoying the $ savings from the program. Participation should help lower the total cost of electricity in Illinois - hey for right now, I hope it just lowers my bill. Thanks for this Blog. I came across this while looking for others who might have experienced a problem like I just did with ComED's RRTP program. I'm going to contact ComED and maybe the ICC if ComED doesn't have a good story for what just happened. For starters we are working to be smart consumers of electricity and our savings with the RRTP program after 5 full months have been good. On the full bill (not just power consumed part) the savings according to the WattSpot site are 25.7%. In terms of savings from managing out electricity use we are doing quite well. I'm in the ComED RRTP program in Waukegan. It took 5 months just to get the meter upgrade. 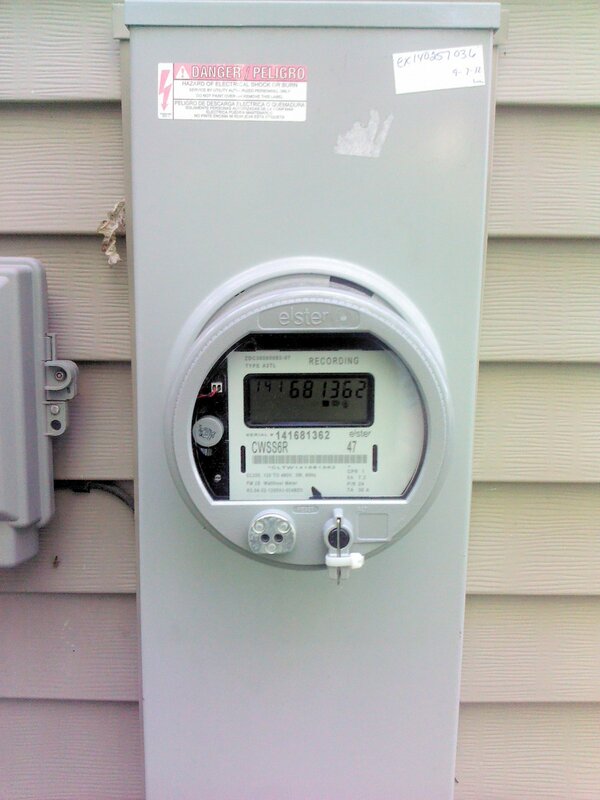 Having happened to see two meter readers at my meter, and having talked to them, I found out that a meter reader needs to physically be on site plug into the meter each month to download the hour to hour usage. I noticed after RRTP was active that my bills always showed the reading as ACTUAL, no longer ESTIMATED. That made sense as they need the hour to hour data to calculate against the hour to hour rate. On my last statement I noticed that BOTH the PREVIOUS and the PRESENT reading was ESTIMATED!!! 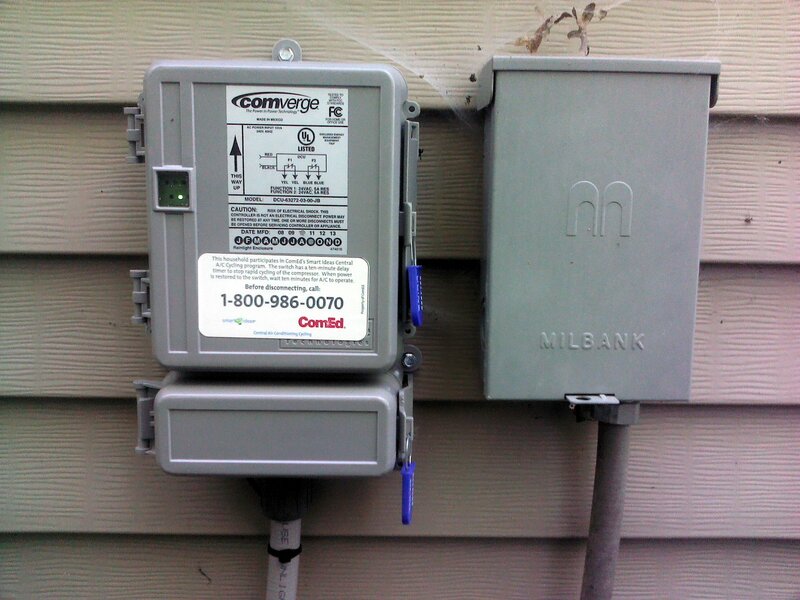 (This is a bit strange as I happened to see the meter reader outside for the last one, but we didn't speak.) There were no estimated meter reading(s) on the bill and yet they still billed me based on a certain number of KW hours. RRTP confuses many people and they might miss the seriousness of this problem. 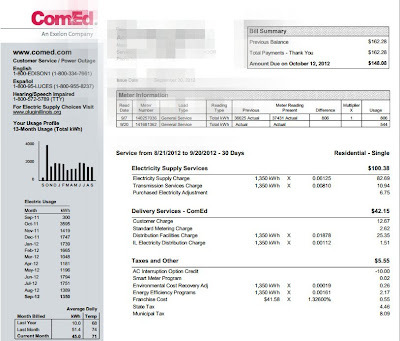 I'm wondering why ComED hasn't notified me what is going on and when and how they will get the correct data and give me an updated bill. I assume that the meter can hold a lot of data past the one month period but I'm not comfortable that ComED will get this fairly corrected. Making up for an estimated/missed reading is NOT like in the old (pre hour-to-hour metering) days. At the fixed rate once you got an ACTUAL reading it was easy to do the math and correct your bill. I'm going to be a lot more comfortable if I know that ComED is closely watched by the ICC in situations like this. Get the ICC involved. My June bill was "estimated" very poorly (50% higher than a typical bill). They re-estimated it to something reasonable after I called several times. I did not get an explanation as to what happened. It was never corrected with real data. My July and August bills were correct, but September was again estimated (high) with no explanation. October was correct, but again, no correction for September. I'm the energy coordinator for a large industrial user (9 meters!) who has been on real-time pricing for years. I routinely download the meter data from their website, along with historical pricing data, and calculate the price; ComEd has always been accurate. Being familiar with both the program and hourly rates, I signed up for RRTP at home. My savings are typically around 30%. (central A/C, gas furnace, gas hot water, gas dryer) My house is an old 2-story with plaster walls (lots of thermal mass) - I chill it at night by programming my set-back thermostat "backwards", and my A/C is normally off from noon until sometime after supper. Many communities such as Lisle have entered agreements to purchase electricity for their residents if they opt in. ComEd does not use the negotiated Village rates in the formula for calculating savings. Therefore, my reported savings are over estimated. If your town has similar purchase agreements you may have to recalculate your savings. A Widget is now available for Android that displays the actual, instant or predicted price: RRTP Widget. It can also alert you if the price passes a certain threshold. Thanks I downloaded the widget (to my Toshiba tablet and Motorola Droid Maxx)-we'll give it a try. Great to have the app now that it's summer.